The American Board of Cosmetic and Aesthetic Medicine is Affiliated and Sponsored by the American College of Aesthetic and Cosmetic Physicians and The American Society of Aesthetic/ Cosmetic Physicians. Must be a M.D., D.O., or D.D.S. 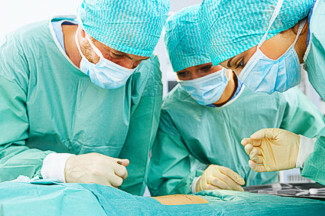 Must have an active, unrestricted license to practice medicine in the United States / U.S. Territories or Canada. *Candidates must not have any suspensions or disciplinary actions imposed on an active license. Must be a ten year member of The American College of Aesthetic and Cosmetic Physicians in conjunction with The American Society of Aesthetic / Cosmetic Physicians. Must meet some combination of training competency as outlined below. Search for Physicians certified by the American Board of Cosmetic and Aesthetic Medicine. The American Board of Cosmetic and Aesthetic Medicine welcome all physicians who meet the basic criteria as outlined above. The committee’s goal was to create a Board that standardizes or universalizes the basic fundamental knowledge and criteria to be called “board certified”. The committee recognizes that all physicians are at different levels of knowledge and experience. While board certification is a milestone in aesthetic medicine, the question is, which certification is better or more credible? Currently these non-affiliated organizations require that an individual take a step 1 course, then a step 2 course and finally a step 3 sitting for a written exam. All of these steps must be taken regardless of experience or knowledge. In the end the cost for taking these steps to get board certified can range anywhere from $10,000 to $15,000 dollars including airline tickets, accommodations, and course fees. Even though these other organizations may be producing top quality education and training, the American Board of Cosmetic and Aesthetic Medicine does not believe that the only thing preventing a physician from becoming certified is cost. We believe that knowledge and experience are valuable assets in medicine. For example, a physician doing complicated cosmetic and aesthetic procedures for ten years has more experience than a newly graduated physician from residency taking several courses with regard to aesthetic medicine. It is for these reasons that the American Board of Cosmetic and Aesthetic Medicine have created several different routes to becoming board certified. A panel of experts is currently being assembled by the American Board of Cosmetic and Aesthetic Medicine to develop a comprehensive test that incorporates ethics and patient safety of aesthetic medical knowledge. When the test is formed and reviewed, it will be similar to other specialty boards requiring review materials. It is not decided if this will be an open book test with review of key fundamental concepts or proctored in a computer center. In the meantime, there will be different routes to board certification as outlined below. We will honor board certification given specifically in aesthetic medicine from other organizations. The applicant will submit their credentials and course outline as well as a copy (not original) of their certificate with a certification fee to obtain a certificate from the American Board of Cosmetic and Aesthetic Medicine. This is currently offered to unify all physicians that have board certification in aesthetic medicine but obtained from different organizations. Potential patients will be able to look up a physician on our site and see all board certifications listed next to a physician including the certifications from other organizations. The applicant can submit to the board all training experiences obtained from seminars and conferences as well as training courses attended in aesthetic medicine. The applicant will submit course outlines, and CME credits. The American Board of Cosmetic and Aesthetic Medicine will make a determination if CME points are accredited and if courses taken qualify. In addition it is recommended that the applicant submit a resume including years of experience, type of experience, memberships, and other board certifications. As discussed previously, a standardized exam is in the process of being developed and formed along with review materials. When this comprehensive exam is created, future applicants will be required to take this exam and pass as well as participate in accredited CME from any organization offering hands on experiences. The applicant will submit all documents (copies only/ no originals) along with a check or money order of $1000. Payment can also be paid by credit card on membership application page. If the applicant’s credentials are accepted, the physician will be issued a certificate from the American Board of Cosmetic and Aesthetic Medicine and the physicians name will be posted online for clients/ patients to search physician’s certifications. If the applicant’s credentials do not qualify, The American Board of Cosmetic and Aesthetic medicine will shred all copied documents sent to our office and return the certification payment in full. Please remember that you must be a member of the American College of Aesthetic and Cosmetic Physicians in order to apply for Board Certification (in addition to the other criteria mentioned earlier). Please Do Not Send documents or a check (payment) if you are not a member. Everything sent to our office including payment will be shredded and not sent back to the applicant if one is not a registered member. Please give up to 3 weeks for processing and verifying any necessary documents or information. Must be a member or renew membership of the American College of Aesthetic and Cosmetic Physicians. Physicians must be a member or renew membership of the American College of Aesthetic and Cosmetic Physicians to maintain certification. Go to our Aesthetic Links page to research available courses that offer acceptable CME credits and meet your needs such as cost, timing, and location of courses. (Please note that the organizations listed on the Aesthetic Links page have no affiliation to this organization). 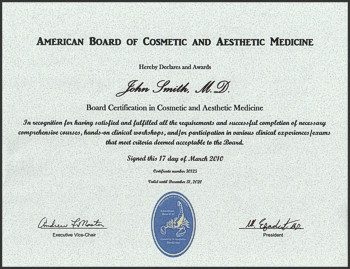 If you are a physician practicing in a country other than the United States or Canada without medical training from a United States accredited hospital as well as without a United States Medical license – You can apply for board certification by the American Board of Noninvasive Cosmetic Medicine & Laser Aesthetics. The American Board of Noninvasive Cosmetic Medicine & Laser Aesthetics is a subsidiary of the American Board of Cosmetic and Aesthetic Medicine. Physicians without a U.S. medical license or without U.S. training will not be able to become board certified by the American Board of Cosmetic and Aesthetic Medicine. The American Board of Cosmetic and Aesthetic Medicine certification is only offered to United States and Canadian Physicians & Dentists to ensure uniformity with a standard level of credentialing for basic knowledge and patient safety in North America. All Physicians practicing in the United States must meet some certain criteria to graduate from medical training programs and to hold a medical license within a state. It is virtually impossible to regulate these standards to a global medical community with varying degrees of credentials and qualifications. The American Board of Noninvasive Cosmetic Medicine & Laser Aesthetics main objective was to create a standard for basic guidelines among the global medical community. This board certification will only be offered to international physicians practicing abroad without U.S. licenses. International physicians will have to meet all the guidelines set by this American Board to obtain certification. Basic fundamental knowledge of aesthetic medicine and patient safety are the two core principle concepts that a candidate must show competency in. As outlined above, a candidate can follow one of three routes to become certified - similar to the American Board of Cosmetic and Aesthetic Medicine. Obtaining Board Certification by the American Board of Noninvasive Cosmetic Medicine & Laser Aesthetics, is not a license to practice medicine in the United States or any other country. Must be a member of The American College of Aesthetic and Cosmetic Physicians in conjunction with The American Society of Aesthetic / Cosmetic Physicians. Must meet some combination of training competency as outlined above (see 3 routes to board certification). The applicant will submit all documents (copies only/ no originals) along with a money order of $1000 U.S.(dollars) Personal Checks will not be accepted from countries other than The United States. Payment can also be paid by credit card on membership application page. If the applicant’s credentials are accepted, the physician will be issued a certificate from the American Board of Noninvasive Cosmetic Medicine & Laser Aesthetics and the physicians name will be posted online for clients/ patients to search physician’s certifications. If the applicant’s credentials do not qualify, The American Board of Noninvasive Cosmetic Medicine & Laser Aesthetics will shred all copied documents sent to our office and return the certification payment in full. Please remember that you must be a member of the American College of Aesthetic and Cosmetic Physicians in order to apply for Board Certification (in addition to the other criteria mentioned earlier). Very Important - Please Do Not send documents or a money order if you are not a member. Everything sent to our office will be shredded and payment will not be sent back to the applicant if one is not a registered member. Re-Certification criteria for the American Board of Noninvasive Cosmetic Medicine & Laser Aesthetics has not yet been established.